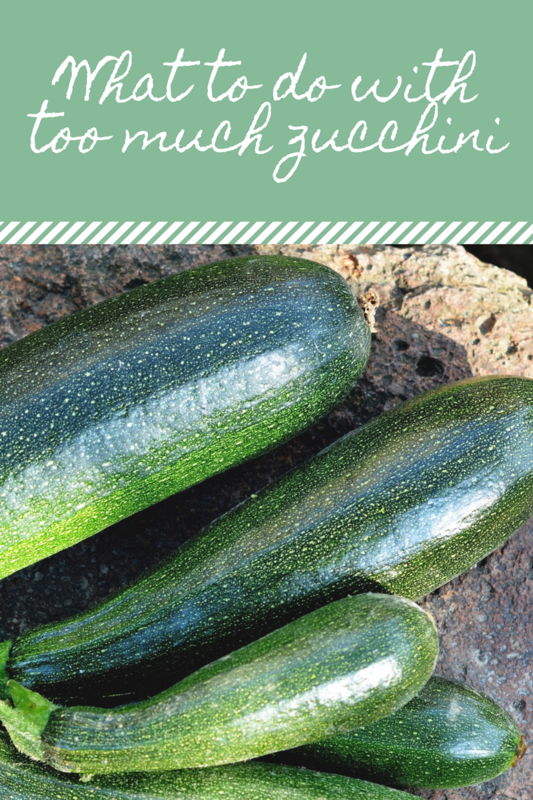 You are here: Home / Food / Recipes / Summer Recipes / What To Do with Too Much Zucchini? What To Do with Too Much Zucchini? Zucchini, just like tomatoes, are easy to grow. Therefore people plant a lot of it, greatly overestimating how much they need. The other crazy thing about zucchini is that it goes from the size of your finger to the size of your arm overnight! Everyone is trying to give it away towards the end of the summer; beware of strangers carrying paper bags. So what do you do with this overabundance of green? So even though it’s healthy, having it the same way every day can get really old. And given its overabundance this time of year, you might want to be frugal and eat as much as you can while still being creative. Grate it and freeze it for later. Hide it in desserts, such as Zucchini Brownies. Chocolate, like cheese, makes everything taste better! Roast it with other vegetables. Grill it in a foil packet with fish. Throw it in a quiche. Slice and dehydrate for a healthy snack. Cut it into slices and top as you would a pizza crust. And if those aren’t enough ideas, check out this zucchini-specific Pinterest board! What are YOUR ideas for too much zucchini? Toss all together and serve immediately. That sounds great too! And I think I have all that on hand. LOVE zucchini and all you can do with it! Mmmmm! Stopping by from SITS, have a great day! Or, you could give some to your bloggy friends! 🙂 We missed putting in a garden since we were moving this year. Would love some zucchini! We love to marinate zucchini in a little in Ken’s Italian Dressing and grill it. Make zucchini ribbons with a potato peeler and quickly steam to soften to “al dente” texture, then serve with your favorite pasta sauce. Works really well with cream based sauces. Mix up a dressing of lemon juive and zest, olive oil, minced shallot, dill, and S&P. Drizzle over thinly sliced raw zucchini and crumbled goat cheese. Sounds strange, but it’s amazing! Oops, I meant to type “juice”, not “juive”, lol. oh my word, I am going to have to try that! Sounds delish. Fun stuff! Amy at http://www.AmysFinerThings.com has a whole index of Zucchini recipes! Check it out! PS Great idea for a post! OH yummy yum. And I wouldn’t even say that I’m a zucchini fan. But seriously, what a great idea for a post! I love it! Try zucchini chocolate chip cookies! LOVE THIS POST!! I just shredded 6 cups of zucchini out of my garden and baked 2 loaves of bread. I am definitely trying the chocolate chip zucchini cookies. Thanks for all the great ideas. and you can puree cooked zuchs and mix into sweetened or unsweetened applesauce. I tried dehydrating the zucchini last week, but I think I sliced the pieces too thinly. They stuck to the trays. I’m going to try again this week. Wow – we must all be on the same wavelength. Great minds must think alike? Lovely recipes, btw. Thanks for sharing them all. I can’t wait to experiment! Hi. I just stopped in from NDIN for some zucchini fun. Great ideas! Those zucchini brownies look scrumptious!! I love zucchini! My favorite recipe with it is . It’s also delicious in this pasta salad–which I’m actually eating right now (leftover) as my lunch at work!